There are two types of guinea pig ball - those that your pets run around inside, and those that they push around and play with. The first type used to be common, but have recently been found to be very dangerous, and so should be avoided at all costs. The second type are generally fine to use, although there are one or two things you should be aware of before buying one. 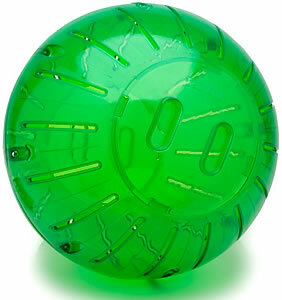 Many rodent owners recommend buying one of the large, plastic exercise balls that your pet can run around inside. These are great for mice and hamsters, and there is wide a range of guinea pig balls available too, so many cavy owners buy one without thinking twice. However, recent research has shown that guinea pigs' spines are not designed to be bent backwards, and doing so can cause severe pain and even permanent damage. Because of this, you should never put your guinea pig in an exercise ball (or a running wheel, which has the same dangerous effect). Exercise balls can cause severe spinal damage and should never be used. Thankfully many pet stores are now becoming aware of the dangers of these balls, and have stopped selling them, although some shops still stock and recommend them. Worse, some will even recommend a hamster or mouse ball as an alternative. These are even smaller than guinea pig balls, forcing your pets' spines to curve even more, and causing them even greater pain. It goes without saying that you should never put your cavy in one of these balls either. A much better alternative to an exercise ball is simply to give your guinea pig an enclosed area to run around in freely. A great way to provide this is with a dedicated guinea pig run or playpen, which can be used indoors or outdoors, and is not dangerous to your cavy's health. The second type of guinea pig balls are those which are designed to be pushed and knocked about, rather than run inside. These are fine to use, and will help to keep your pet entertained and exercised. They are available in several different materials and types - you may find that your pets have most fun with a certain kind, so feel free to give them a variety to see which they prefer. Good-quality natural play balls are inexpensive, provide hours of entertainment, and help to improve dental health. The best balls are made of natural materials, such as wicker, seagrass, or solid wooden blocks slotted together. These are non-toxic, and are also great for your pets to chew on, helping with their dental hygiene as well as giving them something fun to play with. It is worth bearing in mind that these balls tend not to last more than a few weeks, because they will be worn down as your cavies chomp on them. However, they are generally cheap to buy, and often come in packs of two or three, giving you enough to last a month or two. Some balls contain a tasty treat or rattling bell in the middle. You should use these with caution, as the treats are often unhealthy for your pets, and the bells might be swallowed if your guinea pigs manage to break the ball open. A better alternative is the type which can be stuffed with hay, grass, and other types of food that your pet would normally eat anyway. These are often known as 'boredom breakers', and consist of a wire mesh ball with large gaps for inserting food. They make eating more of a challenge, giving your cavies a workout while they eat.